This AidCamp was held in conjunction with our partner organisation SERVE in the community of Uswatte in Sri Lanka. SERVE works primarily in the areas of social work and education for the benefit of underprivileged and deprived urban and suburban children. 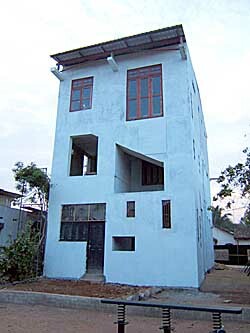 The purpose of this project was to further extend a resource centre built by previous AidCamps by adding a third storey, providing a child friendly environment for the children of the shanty town community in Uswatte, giving them facilities for additional studies, to do their homework, use the library, and play indoor games such as chess and carrom. In addition to working on the building the volunteers were also taken to see SERVE’s work for the poor in the area, as well as on several local and regional sightseeing trips. "The efficient organisation by AidCamps International enabled me to participate in an amazing experience. Our introduction to the project was arriving at the site, been shown our sleeping arrangement which consisted of a schoolroom with bunk beds. It resembled something between 'Tenko' and a school dorm, which, I have to say, enabled us to cultivate some very good friendships. Once we had settled in, we were given a warm welcome by the children and the staff from SERVE, the charity which AidCamps was working with. The children enthusiastically invited us to visit their homes in the shantytown, which was only five minutes away. Our tour certainly brought home the conditions these poor little mites had to endure. One-roomed wooden shacks, very little daylight, and very close together. As we walked down the narrow alleyways on one side each one had a gully for household waste. Each alley lead to the sea, as we reached the rocky waters edge it was evident this was the place that the residents of the shantytown used to bathe, and use as a toilet. It was just a matter of life to them. I could not help but notice the amount of washing hanging on lines and how immaculate the children were. Each child encouraged you to look into their house, but we felt it was intruding, so we stayed in the little courtyards whereupon one we were introduced to one little boy's pride and joy -- a tortoise! Walking back I think we were all a little heavy hearted at what we had seen but even more determined to do all what we could while we were here. The project was to construct a third floor to the existing SERVE centre, which was being used for after school activities; children could come play and concentrate on homework. Social workers were also based here so it was an added bonus for the children to have that extra care and watchful eye. We soon had our routine; breakfast at 7.15, ready for work at 8.00. I must admit toward the end we were on a bit of a struggle to get up in the morning. We always had our daily alarm call from the first train arriving at the railway station. 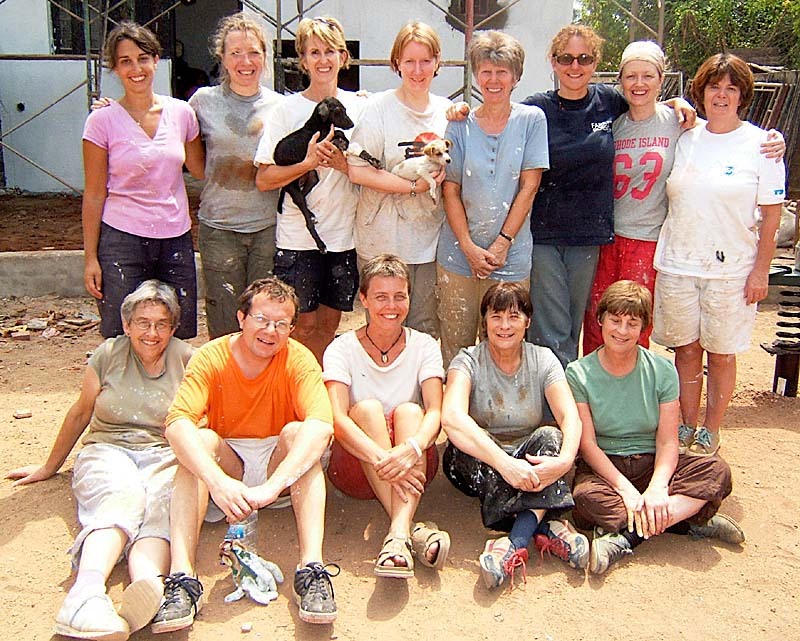 Our time on the building site must have been like many previous volunteers', we were moving hundreds of bricks, hoisting up sand and rubble, sifting sand, plastering and painting. We also produced the artwork to hang in the finished room. Pictures by the children were copied to a larger scale; also large pictures of interest. Cycles of life, flags of the world, faces of emotion, the body, etc. There were 13 of us, not unlucky, that's for sure. We all gelled well and seemed to share the same sense of humour and understanding of the importance of doing our bit. The various trips to different SERVE sites were very uplifting and moving, especially the school for the deaf. I have learnt to laugh with a lump in my throat and tears in my eyes. The children in every centre were so full of fun and mischief. AidCamps and SERVE had been able to give these children an extra boost start in their life, somewhere to meet their friends, help their education and give them a purpose. The warmth surrounding the project was overwhelming, everyone was so kind and friendly to us. While on the top floor hoisting up the bricks and building materials, someone would be waving from the road, whether it was a file of school children, women returning from shopping or men on bikes. In fact you could spend most of the day just waving and looking at everyone passing by but Julie, the AidCamp coordinator, had other ideals! John our 'minder' was a true gentleman. His main concern was for the volunteers, he made sure we were streetwise! Karuna, the lovely lady who prepared our meals, kept an eye on us while we ate to make sure her food was not too spicy and we enjoyed it. Our weekend trips were fabulous. Every day was organised superbly -- visiting temples, elephant orphanage, wildlife safari, a wonderful waterfall where locals bathed and washed (we joined in fully clothed), glorious train trip from Kandy to Colombo, a nerve-wrecking climb up Sigiriya (I thought the end was nigh). After being away for the weekends it was lovely to return 'home' to the site, our bunks, the smell of the bonfires and the railway, especially to see how the local workers had progressed while we were away, they literally worked night and day -- they were great. The final week arrived. It was rather bitter sweet. We wanted to finish the project, but it meant that this new way of life would be finished. The day had arrived when we would hand the building over to the children. A bit of a last minute dash but we were told that SERVE and the builders would do the finishing touches. We were summoned to the building where we were each greeted by a child who placed a garland over our heads. We were each led by the hand up the stairs to watch Julie cut the ribbon. After a very moving ceremony including lighting the magnificent lamp; the children had a new dance room. My heart was heavy as I walked down the flights of stairs for the very last time to say goodbye. All I need to say is a very big thank you to AidCamps, SERVE, and the people who made these three weeks a special moment in time." "All I took was one step, which lead me to an unbelievable journey." "It is a great combination of a worthwhile cause, a cultural experience and a fun holiday." "A holiday with a difference - work and fun!" "A fascinating and rewarding experience. Much better than an 'ordinary' holiday." "A great, rewarding experience. You receive far more from the trip than you give." "This was my second AidCamp and I was not disappointed. Totally different but just as enjoyable. I met a whole new group of people who all worked together." 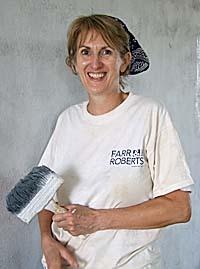 "It was great to contribute one's labour as well as money to a good cause and see the result." "An absolutely tremendous experience. Never done anything like this before and I enjoyed in very much." "Without doubt the most fulfilling, enriching and thought provoking experience of my life so far. I felt privileged to be part of the AidCamp and would recommend the experience to anyone, without hesitation." "Thanks for helping me realise a dream of helping others and working overseas." "A great combination of voluntary work and seeing the 'real' Sri Lanka." "Three weeks felt like a wonderful journey through joyous work, meeting the warm Sri Lankan people and exploring this beautiful country." "All I took was one step, which lead me to an unbelievable journey." "It is a great combination of a worthwhile cause, a cultural experience and a fun holiday." "A holiday with a difference - work and fun!" "A fascinating and rewarding experience. Much better than an 'ordinary' holiday." "A great, rewarding experience. You receive far more from the trip than you give." "This was my second AidCamp and I was not disappointed. Totally different but just as enjoyable. I met a whole new group of people who all worked together." "It was great to contribute one's labour as well as money to a good cause and see the result." "An absolutely tremendous experience. Never done anything like this before and I enjoyed in very much." "Without doubt the most fulfilling, enriching and thought provoking experience of my life so far. I felt privileged to be part of the AidCamp and would recommend the experience to anyone, without hesitation." "Thanks for helping me realise a dream of helping others and working overseas." "A great combination of voluntary work and seeing the 'real' Sri Lanka." "Three weeks felt like a wonderful journey through joyous work, meeting the warm Sri Lankan people and exploring this beautiful country."